It was only last month that I found myself in La Fuente Alemana on a busy street in Providencia in Santiago, Chile. I was there because my husband remembered your ‘No Reservations’ episode where you demolished their lomito – the giant sandwich dripping with cheese and mayo and falling apart under the weight of generous helpings of fried strips of steak, smashed avocado and sauerkraut. We had to have it. Because you did. I followed you around the world. And not just for the delectable food you featured on your shows. In Hungary, I surreptitiously sampled some blood sausage. In Iceland, It was the Hákarl, because you had declared it “the single worst, most disgusting and terrible tasting thing.” Your words, your persona, somehow managed to make so many want to sample even the most vilest tasting thing on the planet. You are unabashedly brash, and refreshingly honest – a master storyteller. And in between the food, the swearing and the drinking you’ve somehow managed to teach me a few things. Being on the road for months, travelling, ticking things off of your bucket list is a great privilege. It’s a luxury. A choice. Yet, there are days when it’s not all rainbows and unicorns. Days when you’re sick or just plain homesick, or when things don’t go quite as smoothly or you’re simply, jaded. And because it is such a privilege, it feels wrong to even harbour a second’s negativity. But your words have been a source of validation, of comfort, “Travel isn’t always pretty.” You taught me that it’s okay to be upfront about the roller coaster ride that travelling can be. Because “The journey changes you.” It truly does. You’ve inspired me to travel to the ends of the earth just to sample a local cuisine. You’ve made me seek out random street carts and derelict restaurants for their food. 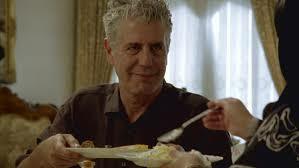 You’ve taught me that food can be divine regardless of cost or creed. You’ve given me the courage to try something so foreign and unorthodox, it borders on being repulsive. And in all this, you’ve taught me to be more adventurous as a person and more appreciative of nature’s bounty. You’ve so beautifully articulated what I’ve always suspected about food – that it’s not just a source of nutrition. They are windows into a culture, a community, a people. Something you’ve shown your followers time and time again, as you dined with locals, bringing us not just the food on their table, but their conversations and their hearts as well. You presented the food and places featured on your show as is, stripped bare of comely descriptions and unapologetically honest. You’ve taught me that true depictions, no matter how bland, can be welcoming too. You’ve also made me take my ambitions as a writer with a pinch of salt. I remember laughing at myself when I read an interview where you had said “it is an unreasonable attitude to look in the mirror in the morning and think, ‘You know, there are people out there who would really like to hear my story.” I’d taken that to heart and it serves as a handy reality check. You are often in my head when I’m on the road, your voice narrating as I bite into some local delicacy or the other. 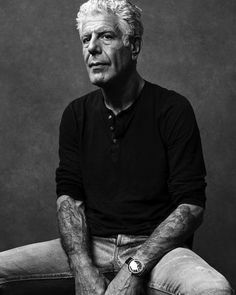 When I’m writing about a food experience, I find myself asking “How would Bourdain phrase it?” Today, in particular, you have taken up permanent residence in my thoughts. I have not been able to shake off the gloom that has descended upon me since the news of your death broke. Never have I ever been impacted like this by a celebrity death. While ruminating on everything you have taught me I have also come to a jarring realisation – you were my idol. You’ve touched the hearts of countless others across the globe. You’ve made millions of nobodies like me aspire to be like you, or at least, a shadow of yourself. Yet, someone so powerful, with a voice that reverberated across the globe, was not heard. I naively thought it would be a heart attack that’d take you, from the battery your arteries received from food and drink. Not depression. Just goes to show how much harder we need to work on mental health. Sobering. Alarming. I pen this while seated under the shadow of a deserted lighthouse in a quaint Uruguayan coastal town, a meaty chivito clutched in one hand, its juices dripping down my arm. You would’ve approved. As I ruminate on your teachings I promise myself, and you, this: I will continue to savour my meals, in whatever circumstances and locations they may be in, and write about them, with no reservations. Rio is unlike any city I’d been in before: not just geographically, where the urban sprawl gives way to fine, sandy beaches and rainforest covered hills with sheer drops down to stunning lagoons, but also culturally as it exudes a vibrant yet laid-back vibe. A nervous mum dispels the myths about travelling with a small child in the remote mountain kingdom of Bhutan. Ciudad del Este, Paraguay’s second largest city, is famous. But perhaps not for the more conventional reasons. Set on the tri-border with Brazil’s Foz do Iguaçu and Argentina’s Puerto Iguazú, the city isn’t quite on the tourist trail like its neighbours. Instead, it seems to have gained notoriety as one of the region’s busiest hotbeds for counterfeit goods. With rumours that the city had harboured the likes of Osama bin Laden, it has long held the imagination of screenwriters, featuring on popular crime shows like NCIS and Miami Vice. For our family of three, however, the lure lay in the prospect of experiencing a new culture within close proximity to our base in Foz do Iguaçu—a 15-minute bus ride to the border.